He's finally crept out of his bright yellow packaging to terrorize the world. Chucky is here, and he's got an all-new look for the upcoming Child's Play Remake. Orion Pictures presents a KatzSimthe Production. Yes, here is our first full reveal of Chucky, as reimagined by director Lars Klevberg for new audiences. 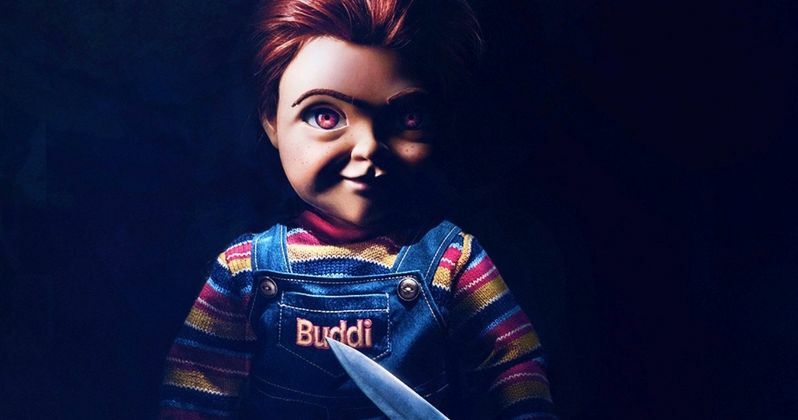 The remake will feature an ensemble cast headlined by Aubrey Plaza, Gabriel Bateman, Brian Tyree Henry and the iconic Mark Hamill as the voice of Chucky. Child's Play is in theaters everywhere June 21, 2019. A contemporary re-imagining of the 1988 horror classic, Child's Play follows Karen (Aubrey Plaza), a single mother who gifts her son Andy (Gabriel Bateman) a Buddi doll, unaware of its more sinister nature. Director Lars Klevberg is working from a script by writer Tyler Burton Smith. Producers on the movie include Seth Graham-Smith and David Katzenberg. Early this month it was announced that Emmy and BAFTA Award winning composer Bear McCreary will reimagine the soundtrack. He is perhaps best known for his work on The Walking Dead. His other soundtracks include Battlestar Galactica and 10 Cloverfield Lane. After first announcing that they were after an A-list actor to replace Brad Dourif as the voice of Chucky, Mark Hamill confirmed that he'd be giving this electronic terror doll its personality. While an acting legend for bringing Luke Skywalker to life in the Star Wars saga, Mark Hamill has also racked up quite a few iconic voice rolls. Perhaps most notably he played The Joker in the Batman animated series from the 90s, and has continued playing the Clown Prince of Crime in various projects over the years. Interesting enough, it was recently discovered that Mark Hamill already voiced Chucky in a segment for Robot Chicken that also included Buffy the Vampire Slayer and a garden of possessed Cabbage Patch dolls, which, believe it or not, is based on a true story. Hamill forgot he'd done the role until it was recently rediscovered. We've heard his new laugh, and the actor hints that his upcoming Chucky voice will be slightly different from what we've heard before. The original Child's Play found the spirit of a maniac possessing a doll. This new Chucky will be technology driven. There hasn't been much revealed beyond that. The first trailer only teased the doll's presence. And we haven't seen him in action quite yet. Chucky will be a mix of CGI and animatronics this time around, lending a bit of authenticity to the scares. Aubrey Plaza has teased that this version of Child's Play will be more in line with Spielberg's Amblin output from the 80s than the actual horror genre of the era it has sprung from. The original creator, cast and crew haven't treated this remake too kindly in the press. And most fans had sided with the original team. But after the trailer reveal and the announcement that Mark Hamill was doing Chucky, some folks started to come around. Even original director Tom Holland was down with the idea of Hamill coming into inhabit the doll. So how will fans respond to Chucky's new look. We just have to throw this out into the world and see how it goes. We'll know soon enough. This latest reveal comes to us from BestBuddi.com.